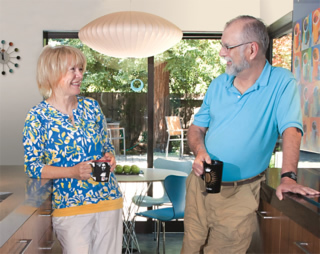 Anne and Mike Cisson and their winning kitchen in their Walnut Creek Eichler. 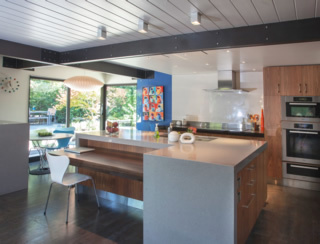 Congratulations to Anne and Mike Cisson, the Walnut Creek Eichler homeowners behind the winning kitchen in CA-Modern magazine's 2013 'Best Kitchen Remodel Contest.' For being named contest winners, the couple was presented a $500 prize. The Cissons' kitchen was voted first place by CA-Modern's poll of hundreds of readers who cast votes online. Their kitchen was selected from four finalists for its overall beauty and functionality, and cohesion within the mid-century modern design aesthetic. Contest runners-up were Peter & Tara Ford, Sunnyvale Eichler. Design: The Fords with Artistic Kitchen Design and Keycon, Inc. Contractor: Keycon, Inc. Kitchen design: Garcia Studio Architects, Inc.
Anne and Mike Cisson love fine wines and great cuisine. But when dinnertime used to roll around, her daughter Jennifer teases, Anne would most often sing out, "Okay kids, it's time for dinner. Get in the car!" 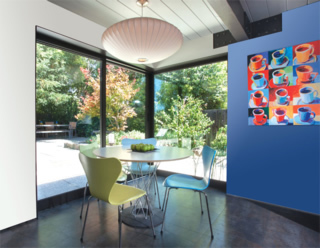 Still, when the Cissons moved into their Walnut Creek Eichler in 2007, they knew they wanted a great kitchen, one that would be the heart of their home. And so it has become. Working with architect Lourdes Garcia, and initially with Garcia's then-partner Joe DeCredico, and with Stephen Steele of S&Z Construction, the Cissons have created a space that's roomier, lighter, and more functional than the original kitchen, while preserving the spirit—if not the footprint—of the original 1969 Claude Oakland design. "It is so versatile, no matter how you use it, in terms of day-to-day cooking, or doing a project at the counter, or entertaining for a party, or just having a few people over," Anne says. When the Cissons got word that they were the winners of CA-Modern's 2013 'Best Kitchen Remodel Contest,' "We were totally surprised," Mike says. Anne opened the congratulatory e-mail and exclaimed, "We won!" They spread the word to their friends. "We were very jazzed," Anne says.